This is a continuation of my previous post. 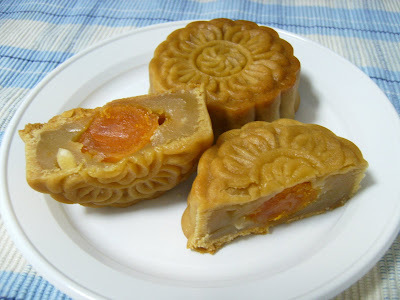 In my last post, i only show the exterior of the mooncake that i have make because it's not suitable for eating yet. 3 days later, i cutted the mooncake and took a quick snap of the interior before it was being wallop up. It's a pity that i brought ready make lotus paste and i found it too sweet. Perhaps, next time i should attempt to do the lotus paste myself or otherwise, should look for another supplier. According to my baking friend who bought my mooncake ingredients for me, there's another version of the lotus paste which is reduce sugar but it cost more and he's didn't get for me that since i didn't specifically said so. Reduce sugar means reduce raw material yet it cost more, why? haha, i guess that's when less is more and more is less. 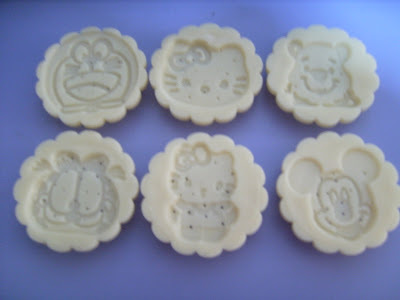 This is my newly acquire cartoon character mooncake mould. There's Doraemon, Garfied, Mickey Mouse (same design as my previous post one but i measured, it's actually slightly bigger), Winnie The Pooh, 2 Hello Kitty (1 head only and another full body) which is my favourite. Some one asked me, why i like Hello Kitty, my reply - because it would not argue with me as it doesn't have a mouth. Well, so does that means i don't like Doraemon? Well not, although Doraemon only got mouth but no ears, i still like it because there will be time when you only want to listen to someone talking instead of you talking, isn't it? Basically, at my age, i shouldn't be so crazy over this sort of things, but some how or the other, when come to this, i didn't seems to grow up and i still wake up early on saturday and sunday to watch the morning cartoon and children's program showed on local channel. Back to my newly acquired mooncake mould. This didn't come easy. Another baking friend of mine from Malaysia have specially went to Kuala Lumpur to search for it. I just happened to over heard sifu mentioning, and i immediately requested for one set. When this baking friend reach the shop, there's not much balance - only 4 sets. She herself got 1 set, sifu 1 set, another of sifu's student 1 set and so kind of sifu to have reserve the last set for me. Inorder not to create any commotion (haha, as if we would fight over it), i rushed down to sifu's house 1st thing when the mould arrived. Every body was laughing why am i in such a hurry. Haha! In order to test out the new mould, sifu have specially prepared 2 sets of pastry for testing out. 1 set is the traditional pastry and the other set is the chocolate pastry. 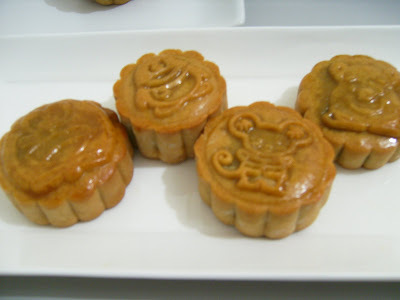 The above 2 picture is the traditional pastry with chocolate lotus paste fillings. You may have noticed, there's 2 character which is not among my set of mould. Actually it belongs to someone else and we were too eager to check out how it look, so we tested out. These 2 does not belong to the 6 in 1 mould. It's 2 standalone separate one. My ealier Mickey Mouse one is also a standalone one. Now i have 2 mickey mouse. 1 among the 6 in 1 and another standalone. These 2 pictures is chocolate pastry with chocolate fillings. So rich that u would thought you are eating chocolate bar. Surprisingly, it turn out that my camera captured the chocolate pastry one better than the traditional pastry one. 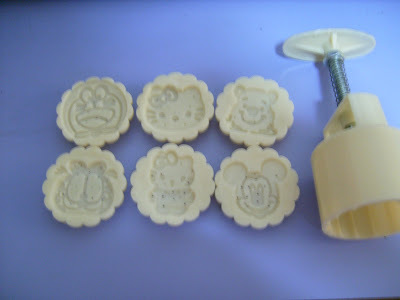 I have not tested my new mould yet because i'm in no mood of making anything. My long awaited ........ is postpone again. I am going to KL soon. 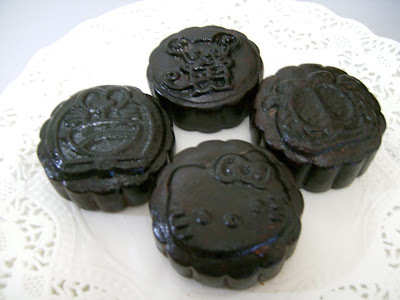 May I know where you got the mooncake moulds in KL? Sorry, i don't know where my friend got it from as i'm not really familiar with the supplier in Malaysia, so i didn't bother to ask. According to her, it's one of those big supplier of bakery items there. She already grap whatever that is available there and according to her, the shop would not be bringing more of this mould till next mooncake festival season. Sorry about that but if i happen to see my this friend again (as we don't meet often), i shall try to get the address from her. I guess if it is a supplier versus a store, yes I can understand that they won't bring in more until next mooncake season. Too bad I am too far away, in Canada and can't just go to KL during moon cake festival. Your molds are really cute. By the time I get to KL, it will be Nov 9, so I think they'll all be sold out. I believe there is Chang Tung and Bake with Yen in KL. I wonder if these are where your friend got them from. It's ok if you don't remember. Anonymous, Wow! Canada, it's really quite a distance from me. I understand in the western country, it's hard to get asian product. I'm trying to get in touch with my friend to get the name and address of the shop. Once i got it, i will put it right here. Meanwhile, while searching for the supplier of this 6 in 1 mould, i found this web - www.shopnbake.com that supply this and ship internationally too. You may be interested to check it out if they still have the stock. i shall get back here once i manage to get the address of the shop in KL from my friend. Address: No. 57, Jalan Medan Midah, Taman Midah, Cheras, 56000, Kuala Lumpur, Malaysia. Hope this would help you in locating the shop. Happy shopping and happy holiday. i found this on ebay. 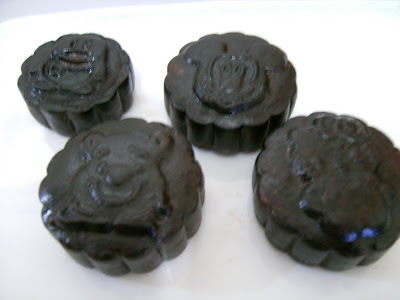 just wondered how large is the mooncake produced by this mould? is it quite tiny? thanks for visiting. I have not actually measured the size of the moon cake, but i think it isn't that tiny, probably about 2 inches in diameter; the regular mini mooncake size. thanks you for your reply. I have already ordered the mold through ebay. I got the smaller one as well because i think the large one that they have is too large!hehe. I did not get the mold as yours but get the round one. 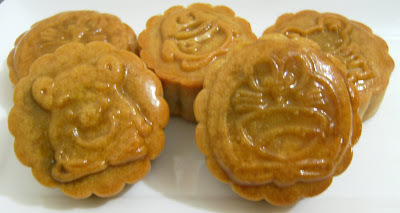 i can't wait to get the mold and try my own version of mooncake. oh and another questionb, is lye water the same as air kapur?or is it air abu? Yes, i think lye water, air kapur or air abu all means the same thing. It's actually akaline water. May I know how much you paid for these mooncake moulds? I have taken a note of the Malaysia address and I will buy from them next time when I visit KL. I like your mooncakes and I am already inspired by them. Keeep up the good work! I couldn't quite remember how much i paid for it. It has been more than a year since i acquired it. i got a friend to get it for me. I think it less than RM 30.